We propose an algorithm that given as input a full word w of length n, and positive integers p and d, outputs (if any exists) a maximal p-periodic partial word contained in w with the property that no two holes are within distance d. Our algorithm runs in O(nd) time and is used for the study of freeness of partial words. Furthermore, we construct an infinite word over a five-letter alphabet that is overlap-free even after the insertion of an arbitrary number of holes, answering affirmatively a conjecture from Blanchet-Sadri, Mercaş, and Scott. This material is based upon work supported by the National Science Foundation under Grant No. DMS–0754154. 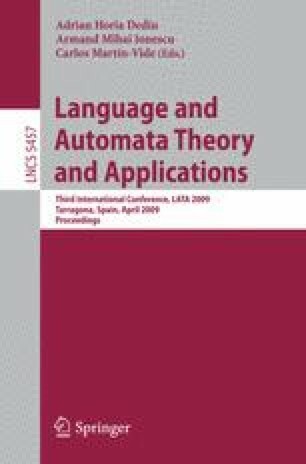 We thank the referees of a preliminary version of this paper for their very valuable comments and suggestions. This work was done during the second author’s stay at the University of North Carolina at Greensboro. A World Wide Web server interface has been established at www.uncg.edu/cmp/research/freeness2 for automated use of the program.